Primary source accounts of Agawam include papers in the Essex Institute Historical Collections by Robert Rantoul (19: B126), Herbert Adams (19:153), George Phippen (1: 97, 145, 185), and Joseph Felt (4: 225), in addition to Felt’s history of Ipswich, which is based on colonial accounts. See, for example, Felt’s paper, “Indian Inhabitants of Agawam”, read at a meeting of the Essex Institute in Hamilton, August 21, 1862. Naumkeag and other villages, such as Mathabequa on the Forest River in Salem, are attested in the accounts of Edward Winslow in 1621 and 1624; members of Roger Conant’s party traveling from Fishermen’s Field in Gloucester to Salem Village in 1626; Francis Higginson’s account of 1629; and the 1680 testimonies of William Dixy, Humphrey Woodbury, and Richard Brackenbury, who described native farming settlements on the rivers running into Beverly and Salem harbors. See also Edward Stone’s History of Beverly, Civil and Ecclesiastical, from its Settlement in 1630 to 1842) and George Dow’s Two centuries of travel in Essex County, Massachusetts, a collection of narratives and observations made by travelers, 1605-1799 (The Topsfield Historical Society, Perkins Press. 1921). An account of Quasquacunquen (Quascacunquen) on the Parker River comes from Currier’s 1902 History of Newbury, which cites the Massachusetts Colony Records (Vol. 1: 146), Winthrop’s History of New England, p. 30, and Wood’s 1634 map of New England. These sources give Wessacucon or Wessacumcon as the original Indian name. In both forms, however, the name was a corruption of the native name for the Parker River and their village upon it. In addition, the name does not mean anything relating to the falls in Newbury in the Byfield parish, as claimed in all contemporary sources. The root words for water, falls, or river are not present in any form. Instead, in present-day Western Abenaki, as explained in Chapter 1, the name translates as “just right for gardens” (or “correct planting ground” or “perfect cropland”). Kwask (quasq; wess) = state of being + wai (ua; a) = “just right, correct” + kikwen (cunquen; cucon) = “fields for planting gardens/corn”, “cropland” = Kwaskwaikikwen (Quascacunquen; Wessacucon). The 1640 map of Newbury is from John J. Currier’s History of Newbury, Mass. 1635-1902: 63. When I asked to see their files on Native Americans, the Gloucester Archives in City Hall reported that there was only a folder of newspaper clippings and articles (the Peterson File), and that there were no Indians on Cape Ann at the time of English settlement! Massachusetts Historical Commission, 220 Morrissey Blvd., Boston 02125: https://www.sec.state.ma.us/mhc/. My understanding of the workings and policies of the Massachusetts Historical Commission comes in part from a personal interview with Jonathan Patton, Preservation Specialist there, on September 5, 2013. LeBaron, J. Francis. 1874 (1931). Archaeological Atlas of Castle Neck, Ipswich. Salem, MA: Peabody Essex Museum. I am indebted to Tom Beddall of Ipswich for access to this map. Information about the specific geographic locations of Masconomet’s fort and residence and deeded land comes from Tom Beddall of Brookline and Choate Island, MA. His sources include 17th century documents in the Essex Quarterly Court Records, on microfilm in the Massachusetts state archives, transcribed in the 1930s by WPA workers under the direction of Harriet Silvester Tapley, author of Chronicles of Danvers (Old Salem Village) 1623-1923. Other sources brought to my attention by Tom Beddall are unpublished first-person accounts and anonymously published articles by Rufus Choate, referenced in Downriver: A Memoir of Choate Island by Mary Wonson, Roger Choate Wonson, and Agnes Choate Wonson. Rufus Choate, who signed his columns as “Chebacco” or “Observer” and the like, published, for example, an article on “Masconomet and His Foes—Where the Chief Lived” in the September 8, 1893 issue of Echo. A history of English occupation of Hog Island is set forth in Duane Hamilton Hurd’s History of Essex County, Volume 2. The history of Masconomet and his relationship with John Winthrop Jr. and the settlers of Agawam is recorded in John Winthrop’s Journal (1790); letters of John Winthrop Jr. in the Winthrop Papers; essays by Robert S. Rantoul in the Historical Collections of the Essex Institute in Salem (19: B126 and 4: 225), and in Joseph Felt’s History of Ipswich… (1966), available at archives.org. See also Felt’s paper “Indian Inhabitants of Agawam,” read at a meeting of Essex Institute on August 21, 1862, reproduced in the Essex Institute Historical Collections 4: 225-228. Goff, John V. 2008. Remembering the Tarratines and Nanepashemet: Exploring 1605-1635 Tarratine War Sites in Eastern Massachusetts. In The New England Antiquities Research Association Journal 39 (2): http://www.neara.org/images/pdf/tarratinewars.pdf. Also: Vaughan, Alden T. 1995. New England Frontier: Puritans and Indians, 1620-1675, 3rd ed., p. 52. The Tarrantine Wars are taken up in more detail in a later chapter. Descriptions of Algonquian defenses come from Edward Winslow’s narratives of 1622 (Mourt’s Relation) and 1624 (Good Newes from New England). Native forts in Salem-Beverly are also referred to in George D. Phippen’s testimony, “Of Salem before 1628” in the Essex Institute Collection, Volume 1 and Joseph Felt’s “Historical sketch of forts on Salem Neck”, Volume 5: 255. Old Castle on Castle Lane in Pigeon Cove, Rockport, is believed to have been built in 1712 by Jethro Wheeler and by virtue of its name was very likely built on the site of a native fort. In considering geography and the history of Tarrantine attacks, it seems certain that watchtowers would have been erected at points with clear sightlines to river entrances. 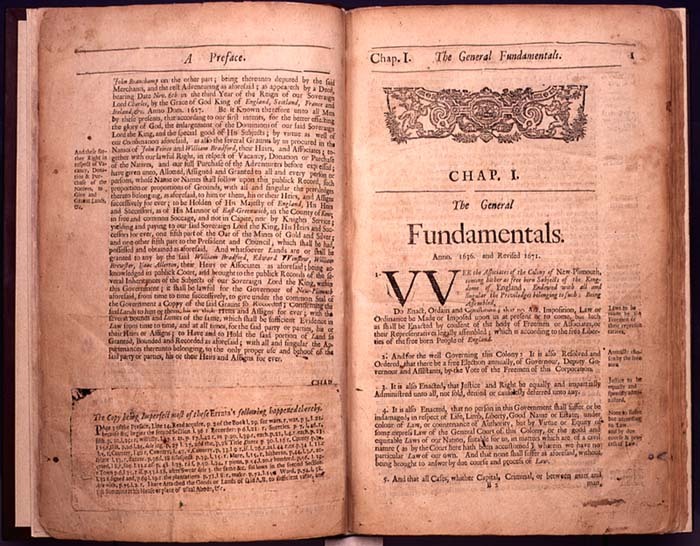 For colonial laws and ordinances regarding livestock, see the Book of the General Laws of the Inhabitants of the Jurisdiction of New-Plimoth, and Generall Laws of the Massachusetts Colony, revised and published, by the Order of the General Court (1632-1676) http://www.princelaws.pdf; also at http://www.loc.gov/exhibits/treasures/images/tlc0200.jpg. See also the classic Nathaniel Shurtleff’ 1853 Records of the Governor and Company of Massachusetts Bay And General Court, Vol. I, 1628-1641 and Vol. II 1642-1649 in the Massachusetts Archives in Boston. A less convenient but to the point source on microfilm in the Archives is Volume 30: Indian, 1603-1705: Records detailing the interactions between the Massachusetts Bay government and native peoples in New England and New York, which is indexed. Deeds to Gloucester and other towns in Essex County—originals, typescripts, and historical context—are on the web site of the Salem Registry of Deeds, Native American Deeds Collection: www.salemdeeds.com/nativeamericandeeds/indiandeedsummary_9-20-06.pdf. The deeds Masconomet and his heirs signed are in the Salem (MA) Registry of Deeds. See also Peter Leavenworth’s article (1999), “The Best Title That Indians Can Claime”: National Agency and Consent in the Transferal of Penacook-Pawtucket Land in the 17th Century, New England Quarterly 72 (2): 275-300. See Sidney Perley’s 1912 The Indian land titles of Essex County, Massachusetts and Map of Indian Lands and Localities in Essex County Massachusetts. These documents are on the Salem Registry of Deeds web site. The text can be read on archive.org. Sidney Perley 1912: 88-134. See also Williams & Tyng et al., Reports of Cases Argued and Determined in Massachusetts Supreme Judicial Court, Volume 51 (1852). The story of Endicott’s surveyors talking to Indians at Wingaersheek is cited in Babson (1860); Adams (1882), The Fisher Plantation of Cape Anne, Part I of The Village Communities of Cape Ann and Salem, Historical Collections of the Essex Institute: 19; and Thornton (1854), The Landing at Cape Ann: or, The charter of the first permanent colony on the territory of the Massachusetts Company. My refutation of the idea that Wingaersheek is a “low Dutch German loan word and etymology for Wingawecheek are laid out in Chapter 1. Carleton Phillips, 23 samples of pottery from Riverview; Phillips, N. Carleton. 1940 and c. 1941. Unpublished untitled transcripts of talks given in Gloucester (MA) on the archaeology of Cape Ann. Gloucester, MA: Cape Ann Museum. See Mary Ellen Lepionka, Fall 2013, Unpublished papers on Cape Ann Prehistory. Bulletin of the Massachusetts Archaeological Society 74 (2): 45-92. Also: Lepionka, Fall 2017, Speck in Riverview. Bulletin of the Massachusetts Archaeological Society 78 (2): 60-70. See also Frank Speck, Massachusetts Indians, especially relating to Cape Ann, Gloucester Daily Times, Aug. 4., 1923; and Dodge, Ernest S., 1991, Speck on the North Shore, in the Life and Times of Frank G. Speck (Roy Blankenship, ed. ): 42-50. Reference to Endicott’s 1642 division of the Indians’ “hoed land” on Cape Ann is in The charters and general laws of the colony and province of Massachusetts (Boston, MA: B.T. Wait and Co., 1814). See also Young, Alexander. 1846, Chronicles of the First Planters of the Colony of Massachusetts Bay, 1623-1636, Volumes 41 and 49. Boston, MA: C. C. Little and J. Brown, and Phillips, James Duncan. 1933. The Landing of Endecott. Chapter IV in Salem in the Seventeenth Century. Boston: Houghton. Documentary evidence includes letters of the first settlers, anecdotal accounts of visitors and descendants, records of Indian land sales, and a hand-drawn map locating an Indian plantation at Old Garden Beach. Cornhill St. for Middle St. appears on an early map and is noted in Babson (1860). “Names of the Rivers and the names of ye cheife Sagamores yt inhabit upon Them from the River of Quibequissue to the River of Wenesquawam.” [“from the Penobscot to the Annisquam”], n.d. (c. 1602-1610); British Library, Egerton Manuscripts 2395 [Fol. 412]. Wonasquam appears on Capt. John Smith’s 1614 Map of New England [in 1605]: http://www.plimoth.org/education/teachers/smithMap.pdf. The detail of Wonasquam on Wood’s map comes from Robert Raymond, 1926 (Reprinted 1969), William Wood’s Map and Description of New England in 1635 (from New Englands Prospect…,William Wood, 1635, pp. 31-38). Also appears in A Book of Old Maps Delineating American History…, Emerson D. Fite and Archibald Freeman, eds. : 136-139: http://freepages.genealogy.rootsweb.ancestry.com/~raymondfamily/WoodMap.html. Josselyn’s reference to Wonasquam appears in his 1674 (reprinted 1865) An Account of Two Voyages to New-England Made during the years 1638, 1663: http://archive.org/details/accountoftwovoya00joss. Dunton, John. 1686. Letters Written from New England. Prince Society Publications Issue 4, Ayer Publishing (1966 edition). Collections of the Massachusetts Historical Society (1846), John Dunton’s Journal: 121-122. Roger Williams’ account of Agawam and Narragansett burial practices is Chapter 32 of his book A Key into the Language of America (1643). For information on Passaconaway and his descendants, see Russell Lawson’s Passaconaway’s Realm (2002) and Charles Beals’ Passaconaway in the White Mountains (1916). For Nanepashemet and his descendants, see Ellen Knight’s Nanepashemet Family Tree in the Wiser Newsletter. Volume 11, Issue 2 (2006): Nanepashemet.pdf. I used Frederick William Gookin’s 1912 biography Daniel Gookin 1612-1687, Assistant and Major General of the Massachusetts Bay Colony: His Life and Letters and Some Account of his Ancestry. The discrepancy in the date of his death is because until 1752 the colonial year began on March 25. Thus Gookin’s March 19 death date would have been in 1686, the same year that Wonalancet and Owufsumug died and John Dunton visited Wonasquam. Moderns have corrected pre-1752 colonial dates to correspond to a January 1 start date for each new year, although for dates between January 1 and March 25 some scholars write the alternatives with a slash, e.g., 1986/87. See Ebenezer Pool, Pool Papers, Vol. I (1823). This is a typescript ms, in the Cape Ann Museum in Gloucester. A handwritten original (or copy) is in a filing cabinet in the basement of the Sandy Bay Historical Society. Pool’s reference to installment payments and payments in kind rather than cash are born out in Harry Wright’s 1941 article, The Technique of Seventeenth Century Indian Land Purchases, in Essex Institute Historical Collections 77: 185-197. The Massachusetts Historical Commission Archives in Boston has Records of Deeds by the Massachusetts General Court between 1620 and 1651; Gloucester Records for 1642-1874 (Microfilm A 632); Town Records of Deeds for Gloucester and others from 1701 to 1914; the Commoner’s Book for 1707 to 1820; and Minutes of Meetings of Proprietors of Common Lands. Gloucester Town Records (Vol. I 1642-1714) in the Gloucester Archives in City Hall do not refer to purchases of Indian lands. Gloucester’s 1684 purchase of Pawtucket land on Cape Ann is in the Book of Indian Records for Their Lands in the DuBois Library at the University of Massachusetts, Amherst. The Massachusetts Historical Commission in Boston also has a copy. Lepionka, Mary Ellen and Mark Carlotto. Spring 2015. Evidence of a Native American Solar Observatory on Sunset Hill in Gloucester, Massachusetts. Bulletin of the Massachusetts Archaeological Society 76 (1): 27-42. For an appreciation of the importance of skywatching in the ancient world, see John Mitchell’s 1984 Ceremonial Time: Fifteen Thousand Years on One Square Mile. See also Anthony Aveni’s People and the Sky (2008), and Lynn Ceci, 1978, Watchers of the Pleiades: Ethnoastronomy Among Native Cultivators in Northeastern North America. Ethnohistory 25 (4): 301-317. See Obadiah Bruen’s Town Record of 1650 and the Babson about the naming of hills in the development of Gloaster Plantation (Gloucester). David Stewart-Smith’s and Frank Speck’s ethnographies and the works of Colin Calloway were my principal anthropology sources for understanding Pawtucket-Pennacook social organization, political structure, and kinship system. The story of Samoset, an Abenaki sagamore, who greeted the Mayflower colonists in English and introduced them to Squanto (Tisquantum), a returned Patuxet kidnapee, comes from William Bradford’s history of Plimoth Colony, Edward Winslow’s Mourt’s Relation, Christopher Levett’s Voyage to New England begun in 1623 and ended in 1624, and the 1893 biography of Levett (sometimes written as Leverett; Bradford wrote Levite) by James Phinney Baxter. The trail maps were created in 2002 by GIS Director Tom O’Leary of the Southern Essex Registry of Deeds (used with permission). They are in the Native American Collection on the web site of the Registry of Deeds as Ancient Indian Trails and Canoe Routes of Essex County. More trail maps for the Pawtucket-Pennacook may be found in Chester Price’s 1958 article, Historic Indian Trails of New Hampshire (The New Hampshire Archaeologist 14: 1-33), and in Wilkie and Tager’s Map of Native Settlements and Trails c. 1600-1650, page 12 in the Historical Atlas of Massachusetts (1991). See http://www.geo.umass.edu/faculty/wilkie/Wilkie/maps.html. Phillips, Stephen Willard. October 1955. Evolution of Cape Ann Roads and Transportation 1623-1955. In Transportation. Salem, MA: Essex Institute Publications. Haviland, William A. 2012. Canoe Indians of Down East Maine. Charleston, SC: The History Press. Also, Edwin Tappan Adney, 1964, Bark Canoes and Skin Boats of North America (with Howard I. Chappelle). Bulletin of the United States National Museum (Washington DC), Republished in 2014 with Howard Chapelle and John McPhee, Skyhorse Publishing (New York). Information about native canals and causeways is anecdotal or ethnohistorical, based on colonists’ accounts, cited in the early histories of Newbury and Ipswich. See, for example Joshua Coffin’s 1845 A Sketch of the History of Newbury, Newburyport, and West Newbury, from 1635 to 1845, John Currier’s History of Newbury, Mass. 1635-1902, and Joseph Felt’s History of Ipswich. The Cow Island causeway at the southern end of Riverview, which no longer exists, is referenced in Stephen Phillips’ article, Evolution of Cape Ann Roads and Transportation 1623-1955, in Transportation (October, 1955, Essex Institute Publications). Cow Island is now indistinguishable from the Riverview mainland. The map is a detail from Plan of Annisquam River in City of Gloucester, made in December 1911. It is online as a product of a defunct government agency, the Commonwealth of Massachusetts Harbor and Land Commissioner’s Office, which operated in the late 1800s and early 1900s. Native rock features and stoneworks, including ceremonial stone landscapes (CSLs) and petroglyphs, are taken up in greater detail in Chapter 7. Roads, Samuel. 1880. History and Traditions of Marblehead, Chapter I. Boston: Houghton Osgood & Company. Pawtucket seasonal migration between Wamesit in the vicinity of Lowell and the Essex County coasts is attested in the accounts of John Winthrop Jr., Daniel Gookin, Joseph Felt, and the earliest histories of Lowell, Chelmsford, Billerica, and Dracut, including Charles Cowley’s 1862 Memories of the Indians…. (Vol. I). Also Frederick Coburn, 1920, History of Lowell and Its People. Depending on water level you could travel by canoe from Ipswich Bay to the Merrimack River with only minor portages via the waterways of the Shawsheen Valley. Each of these locations had desirable resources. For example, outcrops on the Skug River were the nearest sources of steatite or soapstone for carving bowls and atlatl weights. Following the Shawsheen River you would come out in the vicinity of North Andover or Lawrence and then would travel west on the Merrimack to Pawtucket Falls and Wamesit in Lowell. See https://www.fonat.org/shawsheen/. The prejudicial view that New England Algonquians were inconsequential because they “wandered” and did not build cities or monuments was first expressed by early archaeologists of the post-Civil War era, such as F. W. Putnam, and has tended to persist until the present day. Previous Previous post: CHAPTER 2: Where are Agawam and Wenesquawam? Next Next post: Chapter 3 What did Champlain see in the “Cape of Islands”?